The Texas Teacher Evaluation and Support System (T-TESS) is a system designed by educators to support teachers in their professional growth. T-TESS strives to capture the holistic nature of teaching – the idea that a constant feedback loop exists between teachers and students, and gauging the effectiveness of teachers requires a consistent focus on how students respond to their teacher’s instructional practices. For those reasons, each of the observable domains in T-TESS focuses on teachers and students rather than separating them out into separate domains. 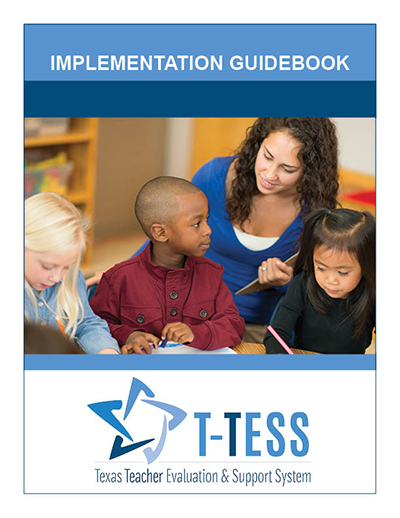 Ultimately, T-TESS is a process that seeks to develop habits of continuous improvement, and the process itself best leads to that outcome when appraisers and teachers focus on evidence-based feedback and professional development decisions based on that feedback through ongoing dialogue and collaboration. The T-TESS Rubric includes 4 Domains and 16 Dimensions. T-TESS domain and dimension rubrics include specific descriptors of practices and 5 performance levels; Distinguished, Accomplished, Proficient, Developing, and Improvement Needed. The purpose of the teacher’s role during this process is to share insights and think about his or her pedagogy and professional practices. A goal of the evaluation process is to include the teacher in a systematic way that assists with individualized professional growth and development. The appraiser has a vital role in assessing teaching proficiency and ensuring that teachers and administrators derive reliable and meaningful information from the teacher evaluation process. By providing evidence-based feedback, appraisers help teachers and administrators make decisions that support efforts to improve instructional quality and student performance. Involving district-level leaders in T-TESS implementation ensures that T-TESS becomes a process for education innovation. Successful implementation hinges on collaboration within and among departments and a deepened commitment to growth-centered supervision of instruction and capacity building throughout the organization. The Texas Education Agency has created 2 training programs for Educator Preparation Programs; the Field Supervisor Observation Training for Teacher Certification Candidates, and the Field Supervisor Coaching Training for Advanced Certification Candidates. © 2019 Texas Education Agency. All rights reserved.